OraCare has harnessed the power of Activated Chlorine Dioxide using a two bottle system. Since true chlorine dioxide is a gas, the two products must stay separated until ready to use. When rinsing simply, place equal parts of OraCare (4 pumps from each bottle) into the cup, allow the product to activate for 30 seconds, then rinse for 30-60 seconds. OraCare’s Activated Oral Cleanser is a great addition to any oral hygiene regimen because of its lack of side effects; no staining, no additional calculus/tartar buildup, and no altered taste. All patients can benefit from preventive measures and this rinse can help. Improving daily hygiene can help prevent disease, and disease is easier to handle before it establishes itself in the mouth A clean mouth is a healthy mouth. 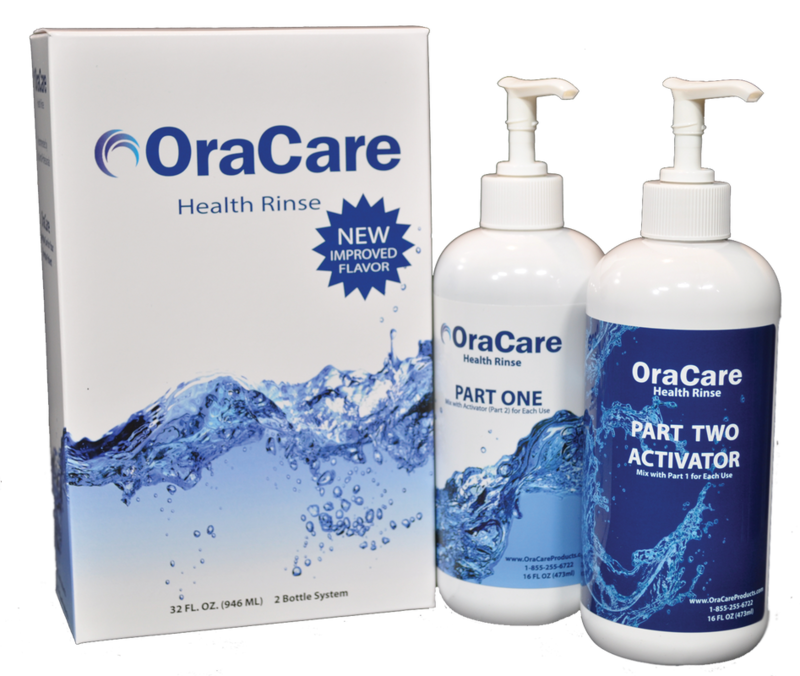 OraCare uses a two bottle system; each bottle is 16 ounces, resulting in 32 ounces of useable product. Patients can use this product long term from beginning to end. OraCare should be used at least twice daily or as directed by a dentist. OraCare also has convenient travel packets that make maintaining a healthy mouth easy on the go! Don't be mislead by the term "stabilized chlorine dioxide," it is actually sodium chlorite. This is not chlorine dioxide and does not provide the same benefits. Since chlorine dioxide is a gas there is no way to contain a gas in a single bottle system without it leaking out. OraCare comes in two bottles in order to create chlroine dioxide with each mix, also allowing maximum benefits. OraCare is made in the USA. OraCare© COPYRIGHT 2015. ALL RIGHTS RESERVED.